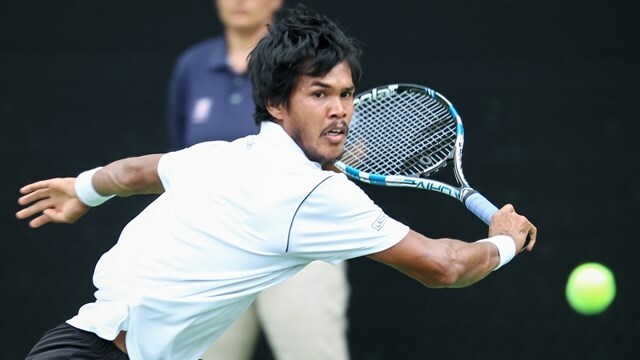 In a match that looked deemed to go the distance, two-time NCAA champion and former University of Virginia standout Somdev Devvarman found traction against doubles specialist, Treat Huey of the Phillipines, striding to a 7-5, 6-3 victory. The first set was a truly battle with each player holding serve through the first ten games. With Huey having a chance to break Devvarman at 5-4, the former Cavalier struck first to go up 6-5, eventually holding to take the set. In the second set, it was evident that the Atlanta humidity was getting to the former No. 20 ranked doubles player as Huey came out deflated and struggled to find his game. Devvarman seized the opportunity, jumping to a quick 4-2 to lead. Huey would manage to hold serve only once more before ultimately falling to his opponent. With the win, Devvarman is now set up to play Shuichi Sekiguchi of Japan Monday, victor over 2012 doubles champion Matthew Ebden of Australia. Sekiguchi maintain control of the match before Ebden retired at 7-5, 5-2. In other action, rising American Jared Donaldson defeated Aussie John-Patrick Smith to advance to the final qualifying round, 6-7(5), 7-6(3), 6-4. Donaldson will face Guido Pella, who defeated Evan Song 6-2, 7-6(5).